The ClickShield Cord Lock is the fast and inexpensive way to weatherproof any power cord, while also eliminating irritating and dangerous disconnects. 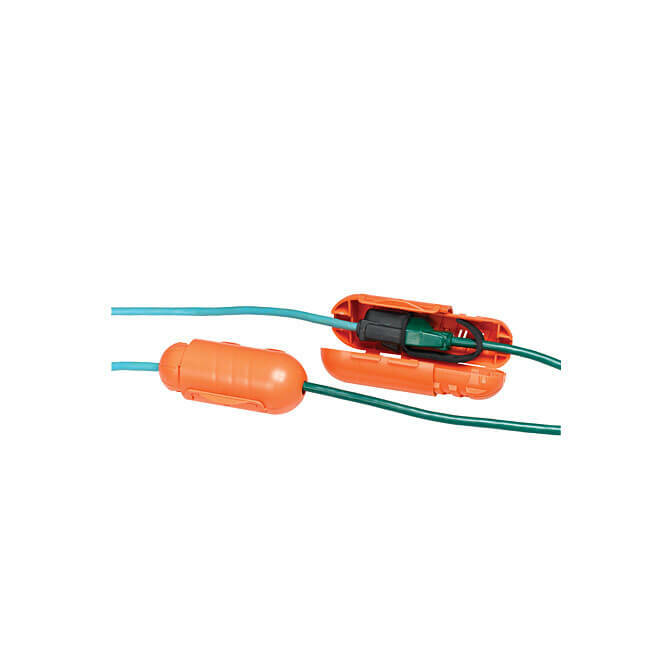 The unique ClickShield Cord Lock is the fast and inexpensive way to weatherproof any power cord, while also eliminating irritating and dangerous disconnects. The durable all-weather plastic shield has a unique ratchet mechanism; when you hear the “click”, you know it’s securely locked. We use our ClickShield Cord Lock to connect our outdoor heated bath and/or or de-icer to the heavy-duty extension cord that leads to the outdoor plug. The internal gasket assures a water-resistant electrical connection. The ClickShield is great for Christmas lights or other electrical holiday yard decor, power tools, or outdoor equipment of any kind. ClickShield is the essential outdoor electrical accessory, and we use them on outdoor holiday lights and on our Bird Bath Heater in winter.